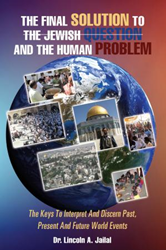 Dr. Lincoln A. Jailal’s new book, THE FINAL SOLUTION TO THE JEWISH QUESTION AND THE HUMAN PROBLEM, ($23.49, paperback, 9781498458863; $9.99, e-book, 9781498458887) answers the most urgent questions confronting humanity today - the Middle East conflict, the roots and rise of anti-Semitism, the strategic importance of Jerusalem now and eternally, the growing threat of Islamism, the worsening persecution of Christians, and the escalation of human suffering. This book investigates the spectrum of human existence from its initiation to its consummation, when YHVH, the One True God, will miraculously intervene to dethrone Satan, the chief enemy of mankind, and establish His Eternal Kingdom. Most importantly, the author reveals the guaranteed solutions and how humans can be rightly reconciled with the True God. Dr. Lincoln A. Jailal holds degrees and certificates in Sociology, Theology, Clinical Counseling Psychology and Chaplaincy. He has been serving as an ordained pastor since 1982. He is the founder of Ambassadors For Christ Ministries (New York, 1998), a non-denominational ministry dedicated to training and equipping pastors and leaders for Kingdom work. He is also a professional clinical counselor since 1998. He has conducted seminars and conferences in several nations of Asia and Africa. He was trained in Israel to serve as a "Watchman On The Wall" for Jerusalem. He serves as a coordinator for the annual Day of Prayer for the Peace of Jerusalem sponsored by Eagles Wings Ministries. Xulon Press, a division of Salem Media Group, is the world’s largest Christian self-publisher, with more than 15,000 titles published to date. Retailers may order THE FINAL SOLUTION TO THE JEWISH QUESTION AND THE HUMAN PROBLEM through Ingram Book Company and/or Spring Arbor Book Distributors. The book is available online through xulonpress.com/bookstore, amazon.com, and barnesandnoble.com.